Buon Park has actively performed as a recitalist, a chamber musician, and as an orchestral player in Korea. She has a lot of enterprising performance experience, including “Between Calm and Passion” Duo Recital with Pianist You-Sun Park, 5 Series of Anima Chamber Recitals, and Tour Recitals “Ditto Orchestra Project Chamber Music Ensemble” in 5 cities of Korea. She loves orchestral works as well as engaging in chamber music. Buon has played with the internationally recognized Asian Philharmonic Symphony Orchestra conducted by Maestro Chung, and the TIMF new music ensemble orchestra. She was also a member of the Ditto Orchestra, and the Anima string orchestra before commencing her studies in Canada. She also has distinguished herself in the field of baroque music with warm sound and fluent using the bow. 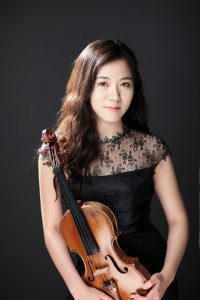 As a baroque violin player, she worked with Baroque Ensemble the Altemusik and the Bach Solisten Seoul. Violinist Buon Park completed her bachelor’s degree with an exemplary scholarship at the Seoul National University. Buon Park finished her master of music degree at Yonsei University, under Professor Young-Mi Cho. Ms. Park continued her music study in Canada. She completed her Artist Diploma at The Glenn Gould School of The Royal Conservatory of Music, in Toronto, Canada, as a pupil of Professors Erika Raum and Barry Shiffman. At The Glenn Gould School, Buon Park performed “Ein Heldenleben” as a concertmaster of The Royal Conservatory Orchestra under the baton of Bramwell Tovey. Her Hansel string quartet won the first prize in the GGS chamber competition. Buon Park has been offered a position of associate concertmaster with the Seocho Phillharmoniker in Korea.